A relatively new author/illustrator for Z and me is Dan Yaccarino. His style of illustration is very unique with simple lines but an incredible use of color. But the thing that we love most about his work so far is the fantastic variety of topics he writes about. 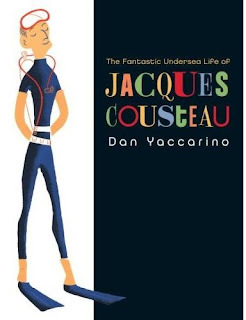 The first Yaccarino book that we brought home was The Fantastic Undersea Life of Jacques Cousteau in April. This was an Easter basket present for Z that was a little bit selfish because I love Cousteau! It's a biographical picture book about overcoming adversity and using the opportunities that one is given. Jacques Cousteau was a sickly child who was encouraged to swim but his own curiosity led him to look beneath the water. When he was severely injured in a car accident, he again turned to swimming to restore his health and strength. From there, he began mixing his love of gadgets with his love of the ocean and invented things like the Aqua-Lung and the underwater camera housing. He became the world's most well-known ocean scientist and shared his experiences with the world through film. 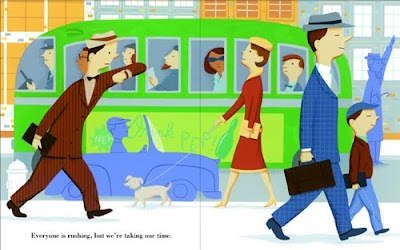 The book has beautiful flowing lines and a non-standard picture book color palette. It also has something I rarely see in a picture book - a list of books for further study. But some of my favorite things in the book are the quotes from Cousteau sprinkled liberally throughout the book. The next Yaccarino book that we discovered came from the library about a month ago -- Every Friday. This is about a boy and his dad who make a special trip every Friday. It's based on Yaccarino's New York City tradition with his own son. Every Friday morning, a boy and his father set out on a leisurely walk to the local diner for a father-son breakfast. They use this special time to talk and bond. This book is incredibly sweet and simple but with a very important message about parents taking one-on-one time with their children. Z loved it -- and not just because the waitress says "Let me guess ... Pancakes, right?" We (Mom, Dad and Z) head to our local cafe almost every weekend and Z's standard (and only) order is strawberry pancakes! This book was an Oprah's Book Club Pick and made it to the New York Times Ten Best Illustrated Children's Books for 2007 list. The final book that we brought home was one that I noticed at Half Price Books when I was looking for something different for Z. This is New Pet from Yaccarino's Blast Off Boy and Blorp series. These are higher Early Reader level books and there are three in the series so far -- this is the second one. It's has the unique concept of a student exchange between Earth and planet Meep, drawn in retro 1950's sci-fi style. Blast Off Boy is missing his dog but fortunately(?) his exchange family brings him "a giant, slobbering green monster", a pet schloppo named Twinkles. He's a bit overwhelmed by this strange pet. Meanwhile, back on Earth ... Blorp tries to make friends with the Smith family dog but Scooter is scared of the alien child and so Blorp adopts a stray hippopotamus instead. Both boys learn about choosing the right pet but also about making do with the one that chooses you. Z of course likes the fun alien drawings and the fact that none of these pets are cats. If after these tempting images, you still have trouble convincing your child to try a Yaccarino book, you can let them know that he is also involved with two popular children's television series, Oswald (creator and producer) and one of Z's favorites, The Backyardigans (character designer). 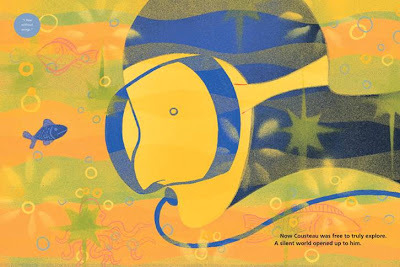 Support our site and buy The Fantastic Undersea Life of Jacques Cousteau , Every Friday and New Pet (Blast Off Boy and Blorp) on Amazon or find them at your local library. One of the sad things about seeing my lovely children turn into lovely teenagers is that our house is no longer filled with wonderful kid books, and those you reviewed would have been winners in our house just a few short years ago! I may have to start getting them again...for me! BTW, I have nominated you for a Let's Be Friends Award...stop by my blog for details. And keep up the good work. 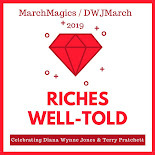 Oh yeah, I will definitely have to check out the Rereading challenge. I keep on saying there are books I need to reread but never seem to make time for them. We love Dan Yaccarino!! We've not read any of these books and the names of the ones we did read are escaping me now! He has a wonderful sense of color and such a good sense of humor that appeals to both grown-ups and children. Yay for Yaccarino! These sound like books my boys would love. We will have to look for them at the library. Jenners and Corbetts - I strongly recommend Every Friday for your boys. Z loved the idea of a book about a boy and his dad. And he's such a mommy's boy. I think that's why the idea was so interesting to him. "Spend time with just my dad? Really?"